Since the mid-twentieth century, the literature on state, market, and higher education has focused on the state’s role shift from direct administration to supervision of higher education, and its increased use of market and managerial principles and techniques to regulate public universities. Few studies have addressed political influences on university governance from changing state–university–market relationships, the chancellorship of public universities, and students’ and academics’ civic engagement in sensitive political issues. With reference to Hong Kong, this book explores the interplay between politics, managerialism, and higher education, and the complex relationships between politics and public universities—in particular, students’ and academics’ civic engagement in politically sensitive issues. This chapter provides the books’ theoretical foundation by reviewing major theories examining the relations between state, market, university, and university governance, and by recapturing the concepts of institutional autonomy, academic freedom, and academics as citizens and public intellectuals, to understand the developments in Hong Kong higher education and guide analysis of the influences of managerialism and politics on university governance in Hong Kong. 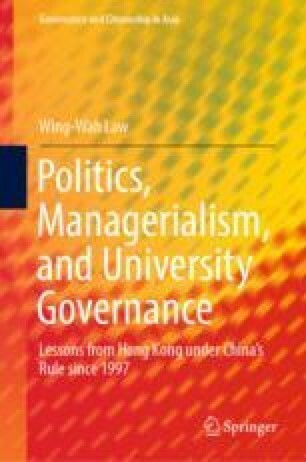 The chapter also reviews specific studies on Hong Kong higher education issues concerning the state, market, and university, and describes the book’s organization. American Psychological Association. (c. 2014). Civic engagement. Retrieved from http://www.apa.org/education/undergrad/civic-engagement.aspx. Behm, N., Rankins-Robertson, S., & Roen, D. (2014). The case for academics as public intellectuals. Academe, 100(1). https://www.aaup.org/article/case-academics-public-intellectuals#.WwvvvUiFOUk. Stuart, D. (2017, March 1). University challenge. Australian Institute of Company Directors Magazine. Retrieved from http://aicd.companydirectors.com.au/membership/company-director-magazine/2017-back-editions/march/university-challenge.